Home » Blog » Uncategorized » What is LED Light Therapy? LED which stands for Light Emitting Diode, is a computer chip that is encased in a glass-like resin, which emits therapeutic wavelengths (or colours) of light energy to provide a desired result. The benefits of different wavelengths used in skin therapy have been identified through a broad array of studies. These benefits include treatment of acne lesions, inflammation, fine lines, wrinkles and hyperpigmentation. 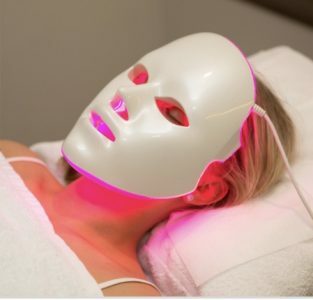 Blue light kills p. acne bacteria, while red and infrared light can reduce inflammation, promote circulation and collagen synthesis, and accelerate healing. The improvement in the skin is based on the same principles as photosynthesis. Light is absorbed by the cells and create a biological reaction, which results in collagen & elastin production. LED Light Therapy is the only aesthetic device that has no contra-indication of any kind. It is good for all skin types and for any skin conditions. You can expect to see minor improvements with one treatment, but for optimal results, a series of cumulative treatments 2-3 times a week over the course of 6-8 weeks is ideal. Pair this with our Microdermabrasion treatment (Celebrity ProSkin treatment) or have it on it’s own. Click here for more information on our facial services.